The average length of a New York City block is 800 feet, whereas Portland’s downtown blocks are a mere 200 feet long. This means that everything is a stone’s throw away, with most attractions and destinations easily accessed on foot or public transit. With countless art galleries, museums, parks, and a laid-back culinary culture, you’ll never be left wondering what to do in Portland. Outdoor adventure seekers and city folk alike will revel in all the uniquely local things to do. The Portland area is home to dozens of independent wineries, breweries, and distilleries. Stay in town or take a trip to the Willamette Valley. We can help you set up a tour or you can create one of your own. A true urban winery, Boedecker Cellars serves some of the best Pinot Noir in Oregon. A quick drive from downtown, this winery is in Portland’s Industrial District, close to Forest Park. Be sure to take home a bottle of one of their signature wines! Located in a remodeled auto body shop, Cooper’s Hall Winery and Taproom offers a spacious setting for guests to eat and drink in style. Wines on tap showcase a variety of flavors and the food menu is designed with fresh local ingredients by Chef Keith Morris. At ENSO Winery, find a handcrafted experience and old-world style where wines take the center stage. This urban winery is just a short drive from downtown. The winemakers source their grapes from the best vineyards on the West Coast. Take a day trip to Ponzi Vineyards, set on 130 beautiful acres just outside of Portland. Founded in 1970, this Willamette Valley vineyard sets the standard for innovation in Oregon winemaking. Sip and sample a diverse collection of wines available in their tasting room. Founded on the desire to get back to the land and reconnect with nature, Cooper Mountain Vineyards sits on 125 acres of beautiful mountainous land. This winery specializes in organic wines created with biodynamic farming practices. Not far from Portland, visiting Cooper Mountain is the perfect afternoon escape. Experience the crossroads of a bustling city and the great outdoors. Enjoy the fresh air while stopping by some of our favorite parks and learning how the Fountain District got its name. Situated along the Willamette River, the Tom McCall Waterfront Park spans 36 acres. The park is a favorite among locals — perfect for jogging, biking, skateboarding, or lounging around. The park also features an interactive fountain and provides an ideal view of seasonal fireworks. A famous Portland landmark, Keller Fountain is a large structure, pumping 13,000 gallons of water per minute through the fountain’s waterfalls. The fountain features tall brick fixtures, allowing visitors to stand at the top of the waterfalls. Part of the Lawrence Halprin Open Space Sequence project, Pettygrove Park showcases a tree canopy and paved walking paths. At the bottom of the park, find a reflecting pool and sculpture, ideal for a morning or afternoon stroll around the city. The first in a series of fountains and parks designed by Lawrence Halprin known as the Open Space Sequence, Lovejoy Fountain Park features a large fountain and paved walking paths. Located across from City Hall, Terry Schrunk Plaza is a part of the “Plaza Blocks” - a collection of three park squares in the middle of downtown Portland. This park features Taihu stones, a gift from Portland’s Chinese sister city, Suzhou. Chapman Square is one of three squares that make up the “Plaza Blocks.” This leafy square is filled with beautiful ginko trees and offers the perfect setting for a morning walk or an afternoon of people-watching. One of three town squares comprising the Plaza Blocks, Lownsdale Square was named for Daniel H. Lownsdale, who settled in Portland in 1845. Spend a lazy afternoon under the tall trees surrounding the Soldiers Monument statue at the center of the park. Erected in the 1800s, The Skidmore Fountain was named for Stephen G. Skidmore and is a designated Portland Historic Landmark. The fountain’s statue was designed in the style of the famous Palace of Versailles. Located in Waterfront Park, the Bill Naito Legacy Fountain offers a fun family experience along the waterfront. Kids will love splashing in the ground-level fountain. Enjoy a whole day of fun in the sun at this Portland destination, open from 6:30am to 8pm during the summers. Salmon Street Springs is in Tom McCall Waterfront Park. The fountain overlooks the Willamette River and offers a fun, water-filled playground for kids on hot summer days. On your tour of the Fountain District, be sure to stop by “The Source.” This fountain is a modest display made up of stacked red bricks. The Source is part of Lawrence Halprin’s Open Space Sequence, which consists of Keller Fountain Park, Pettygrove Park, and Lovejoy Fountain Park. From locally owned boutiques to popular chain brands, bring home your own slice of Portland. Make sure you come with a little extra room in your suitcase for souvenirs! Covering an entire city block, Powell's City of Books is considered the world's largest independent bookstore. It’s truly a Portland landmark and well worth the visit. Bring your home-decorating goals to life with the modern designs of Woonwinkel. This Portland-based business curates home goods and gifts from around the world, created by individuals and small companies. Minimalist Japanese lifestyle brand, MUJI, opened its first location in the Pacific Northwest just steps from our doors. MUJI offers customers a variety of quality items ranging from household goods and stationery to health and beauty products. Born out of Brooklyn, IGWT is a vintage-inspired retailer, specializing in women’s clothing and jewelry. With a second location in downtown Portland, IGWT has become a popular local outlet, beloved for their ethically produced products and impeccably tailored clothing. Founded in 1938, Cameron’s Books & Magazines is the oldest used bookstore in Portland and among the largest vintage-magazine dealers in the U.S. Grab a title or two and spend an afternoon reading in a nearby park or café. Get to know the best of Portland as you explore some of the city’s top attractions. Explore a nearby museum or have a true local experience at a popular resident hangout. The Portland Saturday Market is a mixture of local arts and crafts, hippies, buskers, and food stalls. It’s a weird and wonderful stew of people. Pro tip: The market also takes place on Sundays. Constructed in 1933, the Portland Art Museum is the oldest art museum on the West Coast. It has a fantastic permanent collection of both world-renowned artists and lesser-known regional artists. Overlooking downtown, Portland's International Rose Test Garden is the oldest continuously operated public rose test garden in the United States. It features over 10,000 rose bushes and is next to the Japanese Gardens. During peak season, you can smell the roses from up the street. Five enormous halls bring the fun and mysterious world of science to life at the Oregon Museum of Science and Industry. The museum features hundreds of interactive exhibits and displays, including an earthquake experience, live lab demonstrations, a world-class planetarium, and tours of a real submarine. Find the museum on the Willamette River’s scenic Eastbank Esplanade. Located in Washington Park, the Oregon Zoo is home to more than 2,000 animals from around the world. Renowned for its elephant breeding program, the zoo is home to 21 endangered species and more than 30 threatened species. It also hosts summer concerts and a scenic train route that connects to the Rose and Japanese Gardens. Known as Portland’s living room, this lively square is the epicenter of downtown and the source of its energy. Spend the afternoon lounging on the steps as you take in the local sights at the 40,000-square-foot public plaza. Recently redesigned by acclaimed Japanese architect Kengo Kuma, the Portland Japanese Garden is considered one of the most beautiful and authentic Japanese gardens outside of Japan. Take a peaceful walk around this 12-acre haven of tranquil beauty on the scenic West Hills of Portland. Portland State University is Oregon’s largest university. Find The Hotel Zags on the far edge of campus. PSU parents and professors will enjoy all the perks of staying steps from campus, while delighting in the fun and excitement of our vibrant downtown location. Dive fork first into a world of flavors during your trip to Portland. From the best coffee in the Pacific Northwest to sweet treats and international fare, get a taste of Portland. Get a taste of authentic Vietnamese cuisine at the popular Luc Lac Vietnamese Kitchen, located downtown. Sink your teeth into delectable banh mi, fresh spring rolls, or their famous pho. Classic Italian fare meets a punk-rock aesthetic at downtown hangout Grassa. Delight in handcrafted Italian favorites while reveling in the cool, industrial décor and rock music wafting through the air. Donuts get the gourmet treatment at Blue Star Donuts. Their brioche-based treats are made with the best local ingredients and feature a variety of flavors like old-fashioned buttermilk and blueberry bourbon basil. Blue Star also serves vegan donuts. A hallmark of the Portland coffee scene, Case Study can be found in three locations throughout the city. Founded in 2010, Case Study is known for its high-quality, signature blends. Established in 1879, Huber’s is an iconic Portland restaurant and a can’t-miss stop on your trip itinerary. This American eatery specializes in traditional turkey dinners and is famous for their mashed potatoes. Portland’s first food hall, the Pine Street Market is filled to the brim with gourmet food vendors and communal seating. Sample cuisine from nine of Portland’s best chefs all under one roof, from Korean BBQ to a dessert bar. Now a nationwide coffee retailer and chain, Stumptown Coffee opened its first café and roastery in 1999 in Portland before spreading to Seattle, New York, Los Angeles, Chicago, and New Orleans. See what all the hype is about at one of two nearby locations. Infuse your morning coffee with the flavors and traditions of Mexico. Revolución Coffee House features espresso, Mexican pastries, tamales, empanadas, and more. Situated next door to our hotel, you’ll want to make this Portland staple part of your morning routine. Behind every great hotel is a great restaurant. At Nel Centro, experience artful cuisine lovingly crafted by celebrated chef David Machado. He and his team orchestrate locally grown seasonal ingredients to harmonize with the cooking traditions of Northern Italy and Southeast France. Fragrant ingredients envelope the light-filled dining room for an unforgettable meal. 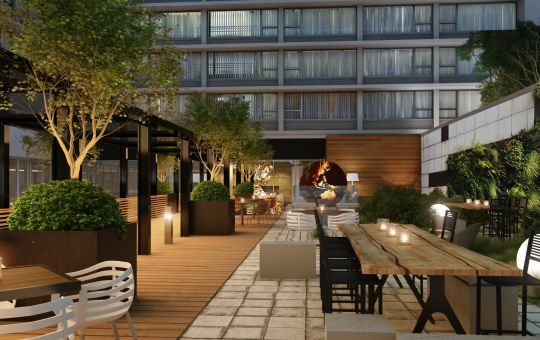 Embrace Portland's love for beer at the horseshoe bar, or enjoy a craft cocktail by a fire pit in our lush courtyard. A welcoming bar area and beautiful garden courtyard all make for a delightful and distinctive space to sit and relax at after your meal. Take a musical tour through some of Portland’s top theaters and concert venues. From underground punk shows to large-scale stadium events, see what’s happening during your visit. “The Schnitz” is a former movie palace turned concert hall hosting more than 900 events each year. Home to the Oregon Symphony, the hall has played host to some of the biggest names in entertainment, from Jerry Seinfeld to Andrea Bocelli. More than a century old, the historic Crystal Ballroom is a hallmark of the music scene in Portland. The venue has hosted a variety of pop, rock, folk, and jazz artists throughout its history. Today, Portlanders can expect to see names like Petty Theft, Maren Morris, and The Mountain Goats. Originally opened as a vaudeville house in 1927, the Aladdin Theater is a popular destination for comedy and concerts. The theater has been an important part of the Portland music scene since its reopening in the 1990s. Named one of Rolling Stone’s top club venues in America in 2013, the Doug Fir Lounge hosts more than 25 shows each month. Their stage has seen countless popular acts throughout the years, including Vampire Weekend, the Cold War Kids, MGMT and more. Home to the Portland Trailblazers, the Moda Center is the largest event venue in the city. The indoor arena hosts everything from hockey and basketball to concerts and theatrical productions. Set free your inner party animal during a night out on the town. Sip on craft cocktails or sample the best local brews at popular bars and late-night spots in downtown Portland. Intimate and inviting, Pépé le Moko specializes in oysters, gourmet bites, and a creative collection of handcrafted cocktails. This stylish downtown bar is ideal for date night or after-work drinks. Co-created by “Top Chef” finalist Doug Adams, Abigail Hall is a chic bar found inside of the Woodlark Hotel. Unwind and indulge with their wide selection of handcrafted cocktails. The Teardrop Lounge was one of the first craft-cocktail bars in Portland. Their expert bartenders have perfected all your favorite drinks and curated a list of new, signature cocktails. Their menu changes seasonally and always reflects a genuine Portland sensibility.